Achieve professional 'right from the dry cleaners' results when you use the Pyle Pure Clean Digital Steam Press. You'll feel good and look good, when you create long-lasting creases and wrinkle-free clothing 50% faster. The Steam Press surface is 9 times larger than the size of regular irons so you will be able to steam more, quicker. Use the Digital Control Center to adjust settings and temperature. Features include, non-stick anti-shine iron surface, 'Steam Burst' function, adjustable temperature selection, 22 x 10-inch press surface and more. 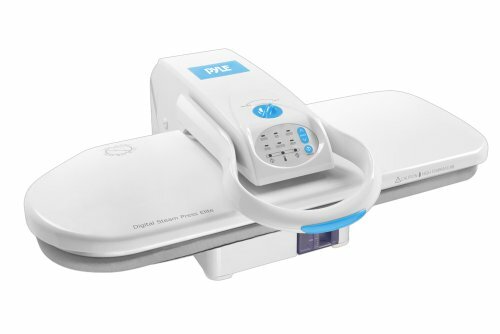 Banish wrinkles with the Pure Clean Digital Steam Press. Even Pressure Ensures Sharp, Long-Lasting Creases; Multiple Dry-Heat & Steam Settings for Different Fabrics; Dimensions: 26.7" x 10.2" x 22.0"